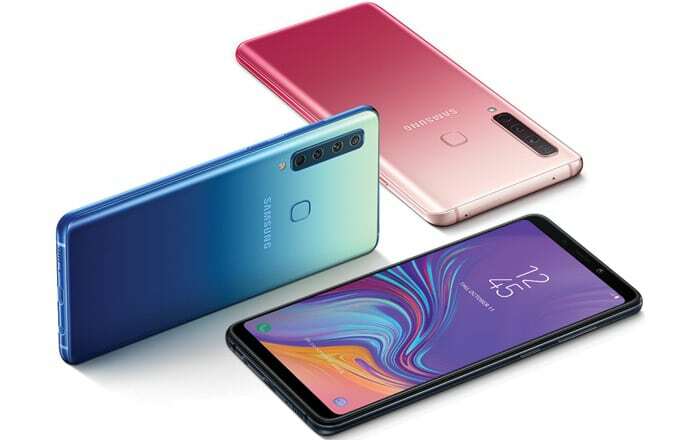 The brand new Samsung Galaxy A9 has been launched with not one, not two, but five cameras! There’s the one 24MP snapper on its front and then four cameras on its rear panel. And in case you didn’t think the smartphone looked enough like a many-eyed, robot-alien bug, Samsung offers them in two gradient color options apart from black. The device comes in a pink ombré hue as well as a blue one, reminiscent of a cobalt milkweed beetle. 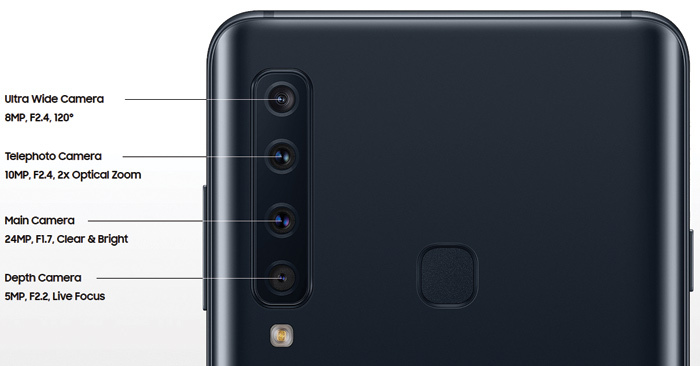 So why does the Galaxy A9 2018 edition need four rear cameras? One of them is a 24MP main lens which works in tandem with a 5MP depth sensor when you want to click photos in portrait mode (or to produce the bokeh effect). Then there’s an 8MP lens to offer a generously wide, 120-degree field of view. The fourth one is a 10MP telephoto camera that delivers 2X optical zoom. These make the device the world’s first quad camera smartphone, of course. The fifth camera on the front is of 24MP resolution. Samsung has put a lot of emphasis on users being able to capture and share every interesting moment of life, leaving no doubt in anyone’s mind on the market it’s tailored for – the social media generation. The five cameras on the handset do not automatically elevate it to the high end range since the octa-core Snapdragon 660 processor powering the setup seems to pull it down to mid-range level. Coming so soon after the unveiling of the latest Google Pixel phones which are part of a series famed for their shooting prowess but still stick to single rear cameras, the Galaxy A9’s five-camera configuration seems excessive. While the former relies heavily on refined software to stay on top of the photography game, Samsung appears to be betting on hardware to convince enthusiasts to reach for the A9.